Have you dreamed of starting a blog but are not sure where to begin. Find clear direction here – How to Start a Blog Easy Step by Step Quick tutorial – only SIX STEPS until you are ready to Login to your new blog. It won’t take long at all. As you can see in the diagram it is easy steps so that you can follow along. The top half of the diagram shows the SIX steps until you’re ready to Login to your new blog. The second half is six steps to publishing your first post. You will have your very own WordPress self-hosted blog – and I will show you how to be ready to write and publish your first post. I am already excited for you because I love the blogger’s lifestyle – It is my hope that you will too. There will be times in the tutorial where you will have to make a decision, and I will indicate that for you. So that the world can see and access your blog, you need a web-based site that will give your blog a home. -You are the boss of your blog. -You can develop it however you want. -You can use Java Script on it enabling post functions and enhancements. -You are free to make money from your blog. -The host of your blog will not delete it. -You have access to countless free plugins (plugins give you easy ways to add functions to your blog). -You can choose your own specific domain name without your host adding their name to it. -Starting out from the beginning on a self-hosted platform has you ready to make your dreams a reality. -All this freedom will cost you the equivalent of one large cup of coffee a month. Who do you want to host your blog with? There are literally hundreds of choices. Some are good others not so good. You want that help to be helpful and timely, and not to be treated like a dummy. If you tell them you are not sure what to do, mostly they will kindly do it for you. Or give you clear instruction for what needs to be done. All hosting sites have some down time where your blog will not be accessible for a short time – you want these times to be as short and as infrequent as possible. You want a host that offers good security from hackers. I have used five different hosts over the years, I have now shifted all of my websites to Bluehost and this is the one I recommend. They have helped me out on several occasions and I have been pleased with their quick responses. 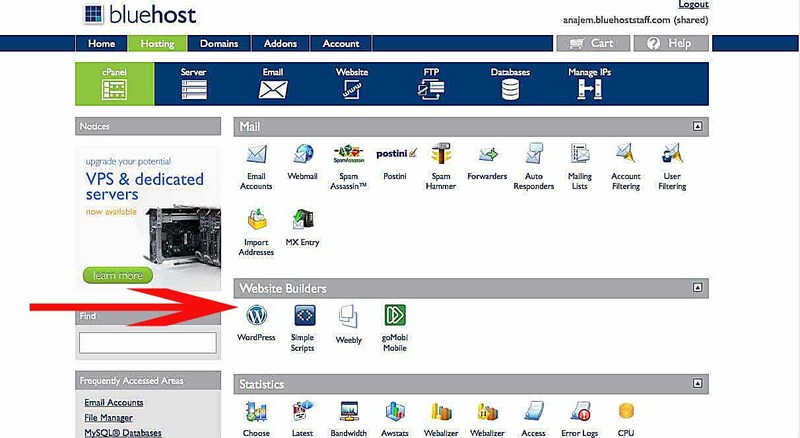 It will open in a new page so that you can go between Bluehost and this tutorial as we work along together. Some of these screenshots may differ a little from what you are seeing, as Bluehost may have updated their site, but the procedure is the same. Click on ‘get started now’. Now we are getting to the good stuff. Choose the plan that you would like. Many use the Plus plan, (that is two cups of coffee each month). If you would rather go with the starter plan then that is good too. You will notice that paying 36 months in advance, is the most cost effective. 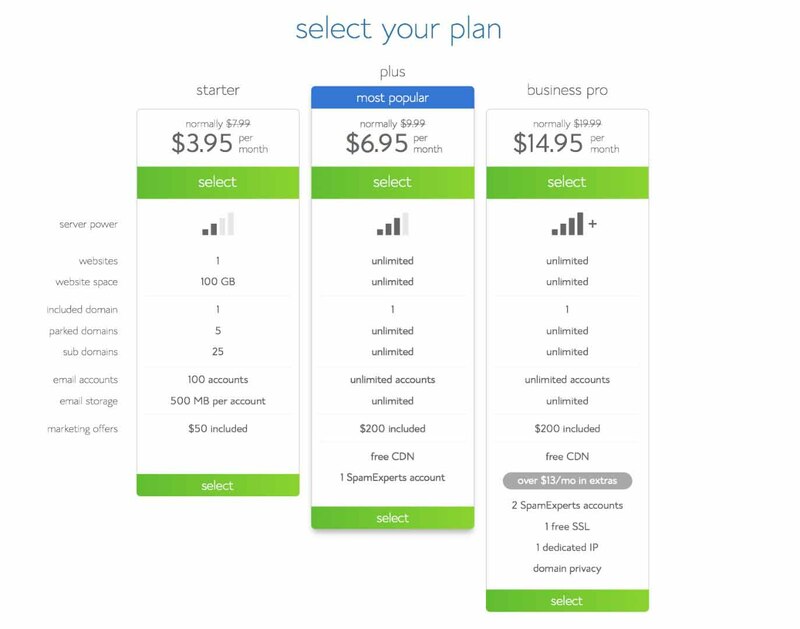 Psychologically having your hosting plan pre-paid for 36 months, reinforces that you are in this to make a go of it, you are not planning to fail. Click on the green ‘select’ button of your choice. If you already have a domain name then you can use your free one later should you want to start a second website. You will see the form above (left) – enter your desired domain name into the form, it already has the .com, so don’t put it in again. Click next, a page presents telling you if the name is available or not. It may give some other domain name suggestions for you. You can return to the form as often as you like to try other names. When choosing a name don’t use numbers, hyphens or meaningless strings of letters, this would make your site look like spam. When you find an available name, try to get a second opinion from a friend. Ask the questions – Is it easy to read, would it be difficult to remember or could it be misinterpreted or easily miss-spelled? If you don’t have someone available I would be happy to help out, just contact me. Use the transfer domain form if you already have an existing domain. Enter your information. The email address that you use will be used to send your login in details. You will then be asked to select your plan like we talked about in Step 2. You will be offered some add-ons. The one that I strongly recommend is the Domain Privacy Protection. It costs around $10.00 a year. All domains are displayed on a public register. Having Domain Privacy Protection, will hide all of your personal details and contacts. 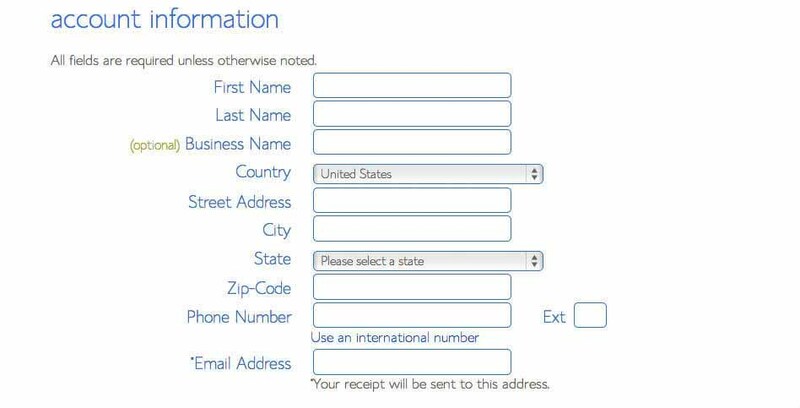 Fill in your billing information – Use a credit card or other options that are available? You will be asked to read and agree to the Terms of Service – when you are satisfied – click the green Submit button. Congratulations – you have done well – you now have a Bluehost hosting account. This will be the home for your blog, next you will download WordPress into it. 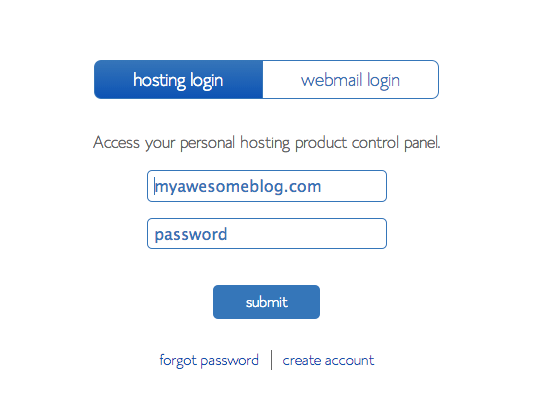 From the email sent to you from Bluehost, follow the link to go back to Bluehost and to login to your account. WordPress is a state-of-the-art personal publishing platform – Guess what? It is FREE. You can download it right now into the Bluehost space that you just secured as a home for your website/blog. 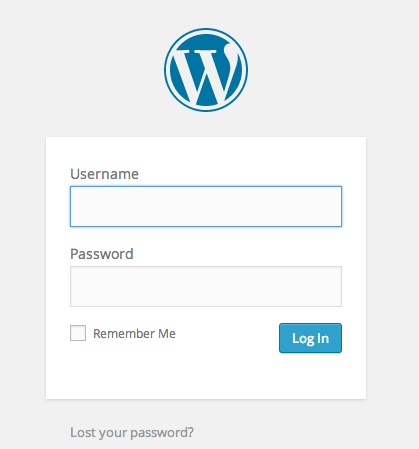 When the Install is finished you will receive an email with instructions to Login to your WordPress account. You now have two new accounts. Bluehost – this is where your website will live for the world to access. Now you will be able to login to your new website. You will see your WordPress dashboard, this is where you can access the different areas you want to work on. Ignore the Launch your new website. First up choose a theme. 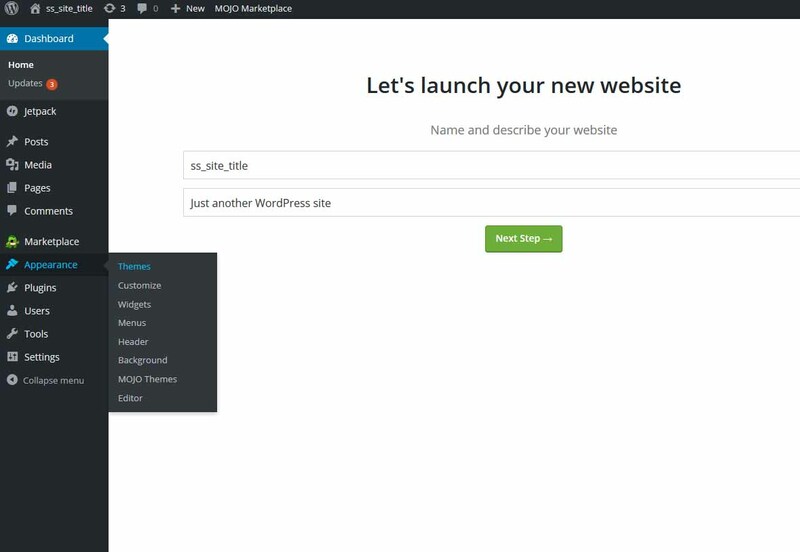 A theme is like a template that works inside the WordPress frame. There are free themes and there are themes that you can buy for around $50. There are advantages to buying a theme. One is that if you run into a problem the theme author will help you out. Free themes also have help. The theme author may help, the WordPress forum offers assistance, or there is a large database of helps. You will see on the above dashboard the blue tag Appearance and then Themes. If you click on Themes you may see some that you like. Here is a helpful page of popular WordPress themes, they are set out and easier to review. I am on a Free Theme called Customizr, I have been tempted to upgrade it to a paid version, but I am quite happy with it. If I struck a problem that I could not solve I would probably go to the paid version. What to look for in a Theme – Absolutes :- It must be updated regularly, it must be mobile friendly and compatible with all browsers. The exciting thing is that you are going to learn a lot in the process of customizing this website to be how you want it. Everything you learn will be used along the way as you develop and change your blog. For those who are time poor and have the finance, you could pay to have your site set up as you want it. The advantage of doing it yourself is that you know how the site functions and how it is built. My advice would be, at this stage, to not pay out more than you need to. Your blogging path will be different from everyone else’s, you are unique and you will want your blog to be unique also. Many new bloggers take around 6 months to learn and to find their strengths and their voice. When that is settled, it will be time to start investing small amounts for blog improvements. The great thing is that these costs do not come all at once and they are not huge. To have your site function well, you will need some plugins. There is a plugin for nearly everything. Look for plugins that have been tested for your version of WordPress, this will be made clear on the plugin. Check when it was last updated. For example, if it was two years ago, it would not be wise to use that one, it is probably outdated and the author is no longer interested in it. To add a plugin – go to Plugins (on the left) and then Add New. From the dashboard, on the left under All Posts, click on Add New. A new page will come up all ready for you to fill with content. Write your post and add any pictures or other media. On the right-hand side click on Save Draft. Click on Preview and you will see your post like your readers will see it. This is a good mode to proofread in as it will look a little different than on the Admin page. When you are satisfied with your content click on Publish. Congratulations: you have set up a self-hosted account and now you have written your first post. You are on your way. This site may use affiliate links, if products are purchased through these links I get paid an amount that helps with my costs. It does not add any cost to your purchase. We are adding more tutorials and resources to this series. Click below and we will send you practical tips to help as you continue developing your blog. gosh i wish i had seen this three years ago when we moved to wordpress, it would have made the move so much easier! I appreciate all the details and step by – this is what any blogger starting or moving to wordpress needs! Pinned! Thanks so much for your encouraging comments. I am in the process of adding a video to this. What a great tutorial, Kathleen! This is such a valuable resource. When I made the switch from blogger to word press, I jumped all over the place, from blog to blog finding various tutorials. You’ve done an amazing job with this and included so many tips. Thank you so much for your kind words Beverly. I do hope that new bloggers or new to self-hosting find it helpful and to take the stress out of doing something new to them. Great article. I like the details you provide about picking a host and platform. I found out how to do these things by trial and error. Thanks for your helpful comments Sherry. It sure saves time if we don’t have to do everything by trial and error. Great step by step! I remember how overwhelming it was to get started blogging but loveit now! This is really great for anyone who is starting a blog! Kathleen I am still on Weebly, resisting till the end! When or if I get bigger I will move over but for now humble me stays at Weebly. However I will pin this twice just in case… you never know. Thank you for providing us with sweet inspiration and a good tutorial. Hi Kathleen, I wish I had know about this when I first started blogging. A really useful and informative post. Thanks! This is truly such a wonderful guide for people starting a new blog. if only I had had such a guide some years back I would have had to work a bit less. You have given such detailed and easy to follow steps to start a blog. Truly commendable! 3[…] Perhaps the idea of creating your own website feels overwhelming right now. No worries, Kathleen has you covered with… - GIVEAWAY: 1 Free Year of Bluehost Hosting + 1 Free Domain Name! – The Art of "Why Not?"